CD Genomics offers a rapid and accurate custom SNP validation on the MassARRAY MALDI–TOF instrument provided by Agena Bioscience. Our MassARRAY SNP Genotyping system combines mass spectrometry, sensitive and robust chemistry, and advanced data analysis software to meet your SNP genotyping needs. MassARRAY SNP Genotyping amplifies the DNA sequence across the SNP site by PCR, and then uses a single extension primer to amplify PCR products, ensuring that the primer extends only one base. The extended product was analyzed by TOF (time of flight) and the SNP was classified according to the molecular weight difference of base, and the allele frequency of the SNP site could also be calculated. MassARRAY SNP genotyping can carry out multiple SNP typing in one reaction. This technique is accurate and has a price advantage when analyzing dozens or hundreds of SNPs. With different detection and software modules, the MassARRAY® iPLEX GOLD technology can realize the research or application of SNP genotyping, gene expression research, copy number variation, gene methylation analysis, pathogen typing and prenatal diagnosis on one platform. MassARRAY SNP Genotyping has a very good application prospect in the fields of biological science, medicine, agricultural research and so on, it has provided excellent solutions for scientists all over the world. Scalable and Flexible: We offer a variety of options for SNP, sample and assay throughput. High Multiplex Capability: Multiplex up to 30 SNP loci in a single pool. Cost Effective: Multiplex analysis reduces per-sample cost, and scalable throughput optimizes batch and resource requirements. 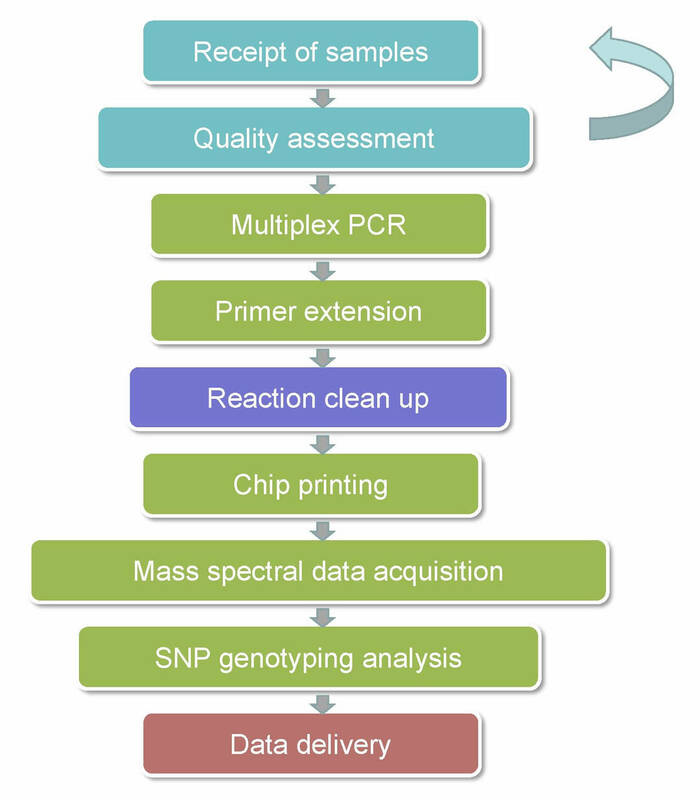 The procedures for our MassARRAY SNP Genotyping is illustrated below. Our service includes customized SNP panels design, oligo manufacture and pool balancing, iPLEX chemistry running, analysis of genotyping and delivery of genotype report in Excel format. Our workflows can be designed to accommodate both small and large assay requirements. If you have additional requirements or questions, please feel free to contact us. How many samples can be processed on the MassARRAY System? It depends on the assay design and the format of the SpectroCHIP Array being utilized. The MassARRAY System processes 2 chips per run. The chip comes in one of two formats, 96-or 384-well format. If the assay design calls for a single well, the number of samples processed in a single run ranges from 768 with the 384-well format chips to 192 samples with the 96-format.